Nick Ragone wasn’t looking for a new job. He had worked at Ketchum for more than a decade, most recently running its Washington, DC, office. Previously, he was associate director at the agency’s New York office. A cold call from a recruiter changed everything. "The person said, ‘If you were ever to go in-house, this would be the opportunity,’" Ragone recalls. "That had never really crossed my mind. I thought I would be an agency lifer. It’s something I had always done and liked." Intrigued by the offer, he spent a day meeting with the leadership team at Ascension. "I said to the recruiter, ‘I’m in.’ I was never going to get an opportunity like this again," he explains. Ascension’s dedication to helping those in poverty struck a chord with Ragone, plus the opportunity to shape the brand of one of the largest healthcare organizations in the country. He was also sold on life in St. Louis, where the company has its headquarters, with its slower pace than his native New York. "Out here there’s very little traffic, the cost of living is great, and people are generally nice," he says. "If you can handle that, you can handle St. Louis." Fast forward two years and Ragone’s now added CMO duties alongside his original role as chief communications officer. He dove into the complex, often bureaucratic world of healthcare and found a passion. As chief marketing and comms officer, Ragone thinks both internally and externally. His work ranges from communicating with the health system’s 160,000 employees to reaching the public with advertising campaigns to digital and social strategy. Plus, he’s head of a national marcomms team of about 300 staff spread across 24 states and Washington, DC. He also works with several Omnicom agencies, including FleishmanHillard for PR, Siegel+Gale for marketing, GSD&M on creative, and Critical Mass for digital marketing. Although he’s based in St. Louis, Ragone travels around the country to meet with his widely dispersed team. "You have to lead by being present. I like to visit all our markets and meet with our CEOs and the team to see firsthand what the market’s up to." He also has a very involved and in-tune CEO, Anthony Tersigni, who Ragone says has been the catalyst for many of Ascension’s changes in the last year and has spearheaded its national rebranding initiative. "Nick has helped transform our comms function into a truly integrated marketing team," Tersigni explains. "Ascension stands for providing personalized and compassionate care in every one of our communities, and Nick and his team are helping bring that message to all those we serve." The brand is becoming a more uniform national organization under Ragone, both in internal structure and public appearance. His first six months on the job were dedicated to organizing the comms function. The health system is one of the largest in the country. It has 141 hospitals and revenue of more than $21 billion in 2016, a 6% increase over the previous year. 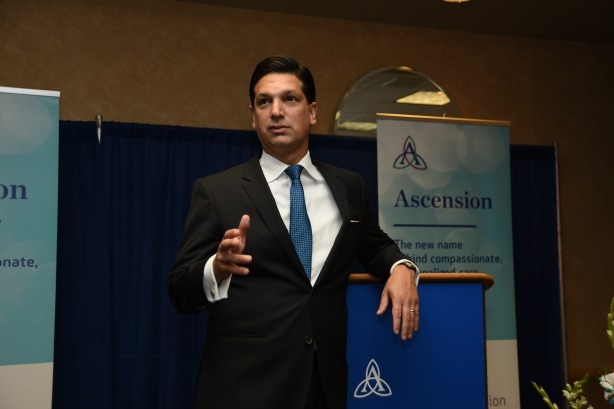 Most of Ascension’s hospitals, Ragone says, used to operate almost independently from each other and the company’s headquarters. "We realized it was wildly inefficient," he notes. "If our health system in Texas wanted to do a campaign on primary care, it would hire its own agency and do its own research and media buying. Then if another market wanted to do a similar campaign, it would do everything on its own as well." 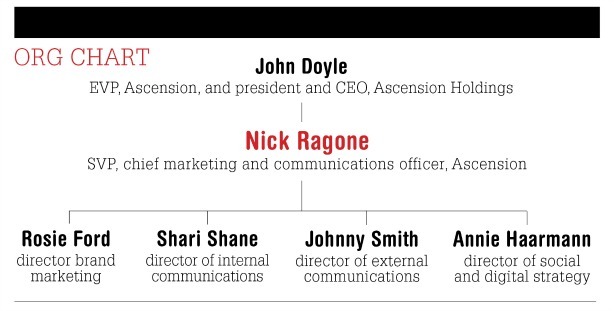 By July, Ragone had officially integrated the national marcomms division. 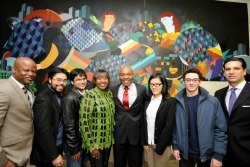 He pulled together a team of leaders from several markets to design the new function. He calls it a shared services model. Now, different markets can share campaigns and compile nationwide analytics. The team did not see many staff changes as a result. But the integrated model created new positions around analytics, which has been a big focus of the integrated marcomms unit. Ragone is also using his position at Ascension to do things close to his heart. A self-described "chess dad," he started an Ascension-sponsored after school chess program for middle schools in Ferguson, Missouri called Your Move Chess last year. The idea came to him from his 11-year-old son, who’s an avid chess player, who had asked if all schools had after school chess. This year, Ascension expanded the program to about 30 schools in the Ferguson-St. Louis area. "I believe that there's a long tail to wellness and taking care of community," he says. "It's not just taking care of their acute care or healthcare needs. Taking care of the long tail of wellness includes bringing programs to communities, like after school chess to schools." Ascension’s restructure reflects a trend in the health provider sphere to break down the old, siloed structure in favor of a national team and joins similar efforts at places like Mayo Clinic. The integrated structure had its inaugural test in March when the brand rolled out a nationwide ad campaign promoting the Veterans Choice program. "It has already paid dividends, and we’ve saved a lot of money," Ragone explains. "We are more consistent in our approach, for example with digital and social. We have much better analytics because we have one set of media buyers. It has made a world of difference, and it’s where we need to go." Ragone’s most recent project is the organization’s nationwide rebrand, which kicked off in September. The health system’s biggest hindrance to being widely known was its disconnected hospital brands. Before September, each hospital had its own name. Now, each hospital and health center will bear the Ascension name alongside its previous name. For example, St. John Providence hospitals in Michigan will become Ascension St. John Providence. He says a national rebrand will help in several ways. First and foremost, it is easier for patients. "If you’re a patient, you’re going to understand, whether it’s a physician group or senior living or hospital or urgent care center, they are all connected and all part of the Ascension brand," Ragone explains. Plus, a national brand will help make online searches smoother, with each hospital now sporting the Ascension name and design. The health system will also benefit from bringing its hospitals’ innovation and work under one name. That could help raise the profile of the brand as a big name, national health organization. "The Ascension brand will become better known," Ragone says. "Most people don’t know we deliver almost as many babies as any system in the world; we do as many complex heart cases as any in the world; and we do as much oncology. But it’s all under different brands." Another method of bringing the organization to the public’s attention is speaking up about issues facing the industry. In this year alone, the industry has been rocked by Affordable Care Act woes, drug pricing scandals, and cybersecurity problems. "Healthcare is going through a dramatic transformation and our CEO has been on the forefront of helping us think about how to win in this new model," Ragone explains. "It’s not the old healthcare system anymore. If you’re under 30, you have no knowledge or you don’t care about how healthcare used to be delivered; you care about how healthcare is going to be delivered to you. And that’s what we’re thinking about." Speaking up on many of these problems falls in line with Ascension’s mission, but it has the double benefit of making the brand a more reputable source, he adds. It created a thought leadership program 18 months ago and has taken a larger role as an expert source, pitching in on the state of the industry through op-eds and speaking engagements. This increased visibility has led to the health system’s leaders being asked to participate in national health events. Most recently, the organization’s chief nursing officer, Ann Hendrich, was a U.S. representative at the UN General Assembly. She was there on behalf of the brand’s work fighting against antimicrobial resistance. "I take enormous pride in our visibility and leadership role in the last 18 months to two years on a host of issues that are critical not just to Ascension, but also to all of healthcare, such as access, Medicaid expansion, drug pricing, and eliminating health disparities," Ragone says. Ascension is only in the beginning stages of its nationwide push. The organization began the process in Michigan and Wisconsin, but 22 states still remain. 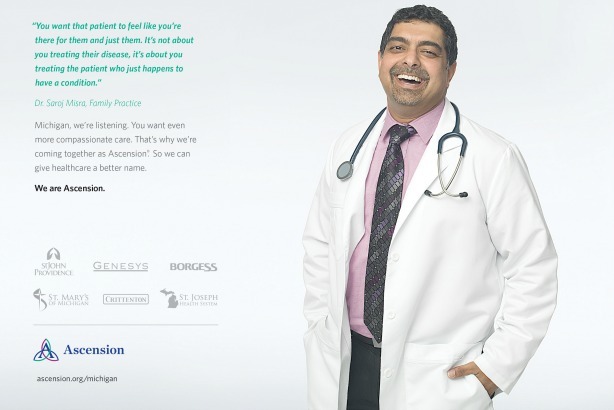 The rebranding campaign includes TV spots introducing the organization’s name and tying it to the local hospital’s brand, along with direct mail and online marketing to the same effect. "We call it the journey to one Ascension," he notes. "If it were a baseball game, we’re still in the second or third inning." Ragone doesn’t have a timeline for the entire rebranding campaign, but with each state’s hospital system taking about 18 months to completely rebrand — largely due to signage, he says — it’s not going to be a quick job. And Ragone is in it for the long haul. Ragone mentions the organization’s mission — with a capital M, he adds — often. It’s a mission that sounds familiar to anyone in healthcare: improving health for all with a focus on vulnerable populations. Where the brand differs from other health systems is in its Catholic roots. The hospital system puts its faith-based heritage and values front and center. "We are the largest Catholic and nonprofit healthcare system in the world," Ragone says. "People trust us to care for them, not just their physical needs, sometimes their emotional needs or their spiritual needs, too. We care for the whole person, and that really comes out of our Catholic heritage." Ascension also has two sisters on staff who advise on the organization’s mission of integration. Sister Maureen McGuire, who Ragone explains convinced him to join the health system, heads up that area. "Sister McGuire was my last interview the first day I was here, and we ended up talking for about an hour," he recalls. "At the end, I was convinced this was the right role for me, so I always joke that she was responsible for bringing me here." Along with the Catholic values baked into the hospitals and health centers, Ascension places emphasis on community outreach and advocacy. One population the organization focuses on is veterans. This year, the health system partnered with the Department of Veteran’s Affairs in an effort to increase care after they return to the U.S. The Veterans Choice program was the brand’s first nationwide ad campaign. Ascension has served more than 6,000 veterans. "They are a particularly vulnerable population, especially when they come back from service," Ragone explains. "Veterans have a lot of needs, and we’re highly attuned to that." He adds that focus on charity and mission is why people come to work for the organization, and why he made the move. The health system spent more than $1.8 billion in 2016 caring for those in poverty.